Richard Brome was one of the masters of the "City comedy," a genre of seventeenthy-century play usually set among the alleys and taverns of London. The Weeding of Covent Garden, in that tradition, depicts the then new and controversial planned neighborhood of Covent Garden as the haunt of dissipated students, dangerous gangs, swordfighting prostitutes, drunken puritans, false Venetian courtesans, and other assorted undesirables. In the play, Mr. Cockbrain attempts to rid the garden of its weeds, with bizarre and hilarious results. The Weeding of Covent Garden was first published posthumously, in the second volume of Five New Plays. The title-page to the collection is dated 1659 and lists the play's title as Covent Garden Weeded. The cover page for the individual play is dated 1658 and gives the title as The Weeding of the Covent-Garden. The running title at the top of each page is The Weeding of Covent-Garden. 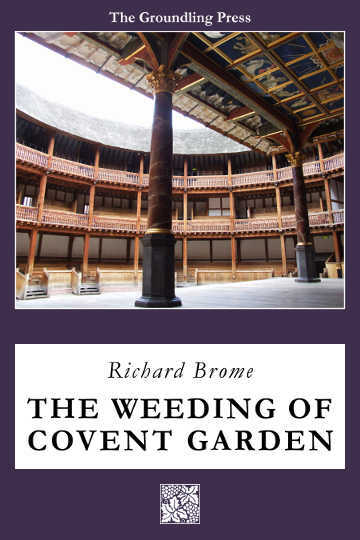 Five new Playes, viz...Covent Garden Weeded.... By Richard Brome. for A. Crook and H. Brome. 1659. 8vo. Each play has a separate titlepage and imprint as follows...Covent Garden. for Andrew Crook. 1658. The collection was edited by Alexander Brome. B.M. (E. 1782 date altered by Thomason to Jan. 1658, i.e. O.S.). Bodl. Dyce. [Another edition.] 8vo. B.M. (G. 18,536).